I try not to make a habit of checking my Amazon ranking and ratings because it can be an easy way to spoil a perfectly good day! But I do pop in now and then (and maybe more than I should – I envy those cool authors who say they don’t check, but wonder if I believe them!! ), and sometimes I get a nice surprise. Lucky, the last time I checked, this is what I found! 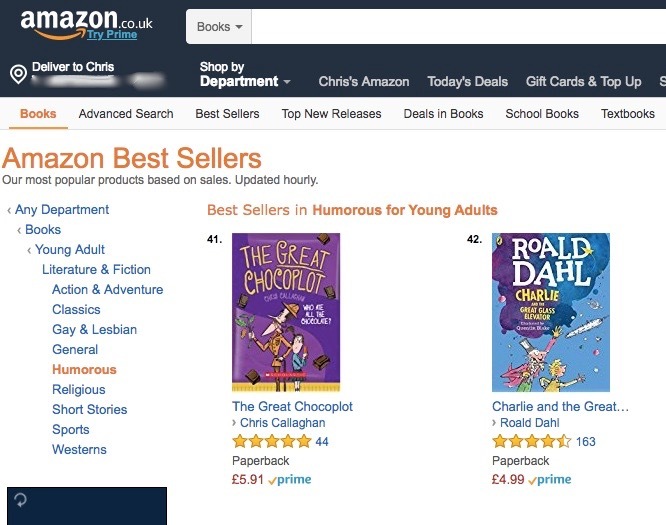 My chocolatey book snuggling up next to Charlie and Mr Wonka and looking like best friends (am I looking too much into this?). I know that it doesn’t take much for Amazon’s sub division lists to fluctuate, but a sight like this seemed like a great ‘screen-shot moment’ before it disappeared. I try not to take rankings and rating too seriously, but they can sometimes put a little spring in an author’s step. If you have read a book that you’ve enjoyed, it’s a great idea to leave a comment on Amazon (or other platforms like goodreads) to let the author know. It also helps that author get more notice as Amazon will promote the books that get reviews, which is a great help to all of us struggling writers. Consider it a polite ‘thank you’, and it’s something the author will be very, very pleased with (so long as it’s positive, obviously!). You don’t even need to have bought the book on Amazon to leave a review there – you could have borrowed it from a library or a friend. Thank you to everyone that has already left a review and I’ll keep checking back and crossing my fingers!